Jo Ann Trick is the editor of Chicken Raising Tales (2011), a collection of delightful essays on the pleasures of keeping chickens. Essayists are local chicken coop owners who have participated in Bainbridge's 'Tour de Coop' - an annual island event that showcases fowls and their fancy homes. 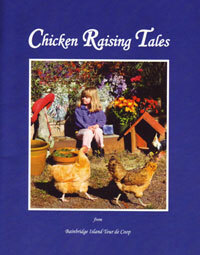 The staff of Bay Hay & Feed describes Chicken Raising Tales as 'colorful, animated and illuminated on each and every page to keep you smiling. A wonderful book for anyone who has ever wondered how to raise chickens, it has humor, wit, and style.' A copy of the booklet is available in the local author collection of the Bainbridge Public Library.